As per the reports one person has died. 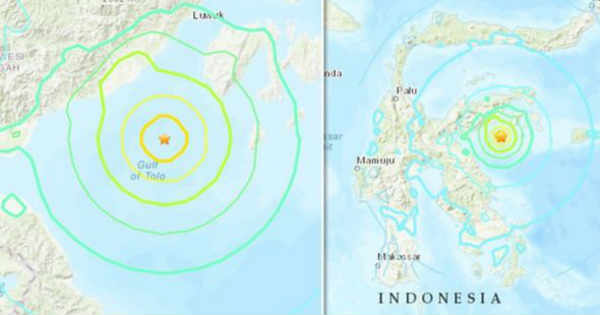 The Indonesian geophysics agency warned residents of the island that a tsunami was possible after the powerful quake. Three light-to-moderate aftershocks occurred in the same area following the initial quake Friday, USGS reported. It had estimated the wave at under a half a metre (20 inches). Indonesia's Meteorology, Climatology and Geophysics Agency (BMKG) declared that around 20 aftershocks after a strong quake struck off Central Sulawesi province Friday afternoon. Hapsah Abdul Madjid, who lives in Luwuk city in Banggai district, Central Sulawesi, where the tremor was felt strongly, said people fled to higher ground and the electricity was cut, adding that residents' fears soared over an imminent tsunami. Indonesia suffered its highest death toll in natural disasters in more than a decade a year ago, following two major tsunamis and several earthquakes, with more than 3,000 killed in Palu, also in Central Sulawesi, the site of Friday's quake. The force of the quake saw entire neighbourhoods levelled by liquefaction - a process where the ground starts behaving like a liquid and swallows up the earth like quicksand. Indonesia is situated along the seismic and natural disaster hotspot known as the Ring of Fire. More than 2,000 people were killed.